Child’s size 4 dress, Simplicity S8897. The dolls are wearing clothes I drafted. Our favorite discount fabric store often cuts “generous” yards. I purchased this whimsical mushroom and fairies fabric to make doll clothes. But I had way more fabric than I needed, so I decided to make a matching dress for a young friend. I looked at my books which have patterns for children’s dresses but didn’t see anything I liked for this project. Our local Joann’s closed a couple years ago and the nearest one is a hike. A doable hike, but it’s now an outing, not a quick errand. So, I decided to see if I could find a commercial pattern on line. And no surprise, you can! I found this dress pattern and two others at www.simplicity.com. And several days later, they were in my mailbox. Pretty awesome! The flutter sleeves on the girl’s dress make me smile. It’s Simplicity pattern S8897. The rick rack trim is shown on the pattern package and I love rick rack. I’d already made the two doll dresses (which are patterns I drafted myself) but I went back and added the rick rack to the hem of both doll dresses and sleeves of the larger dress. So now my young friend will have two dolls with dresses that match hers. The Waldorf type doll models live at my house. You’ve seen the little blonde before. She’s Lucy Birch, and I drew the pattern for her body and all her clothes. The larger doll is Clover. She’s a Sitting Friend, made by Bamboletta. Here’s a detail of the back of the dress, which is closed with 3 loops. I used flower buttons, to match the colors in the dress. Oh to be 5 again, so I could put on this dress and take my dolls out for an adventure. Then again, making these dresses made me just as happy! “Don’t Fence Me In” Flying Geese + Rail Fence Quilt, approximate 42 inches x 55 inches. A good friend of mine gave me a stack of fat quarters recently. The fabrics were mostly beige and brown with some red and green accents. There was a single “surprise” fat quarter with cowboys herding cattle on the prairie in the stack! That presented a great challenge. I decided it would make a fun comfort quilt for a child in a daycare. So I dove into my stash and found the three red and green checkered fabrics and the green polka dots to augment the set. I designed this pattern. I wanted to accent the cowboys and maximize the use of the fabrics in the fat quarters. I mixed 12 inch (finished) flying geese blocks with 12 inch rail fence blocks. The cowboys were fussy cut at 6 1/2 inches, the flying geese blocks are 6 1/2 inches, and the corner blocks were cut at 3 1/2 inches. These are are the unfinished measurements. The strips for the rails were all cut a 3 1/2 inches x 12 1/2 inches, unfinished. The center block in the quilt is a 4 patch (cut at 3 1/2 inches) and the flying geese are set to form a star. 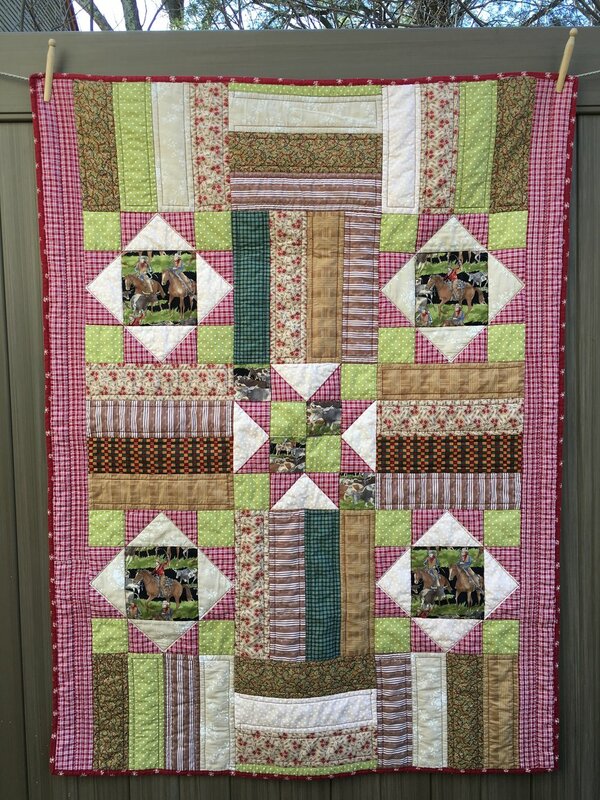 I used the four patch block because that’s all the cowboy fabric I had left after I fussy cut the 4 large patches! For the 4 large cowboy blocks, I turned the flying geese to form a “window” (forming a square in a square) to highlight the feature fabric. 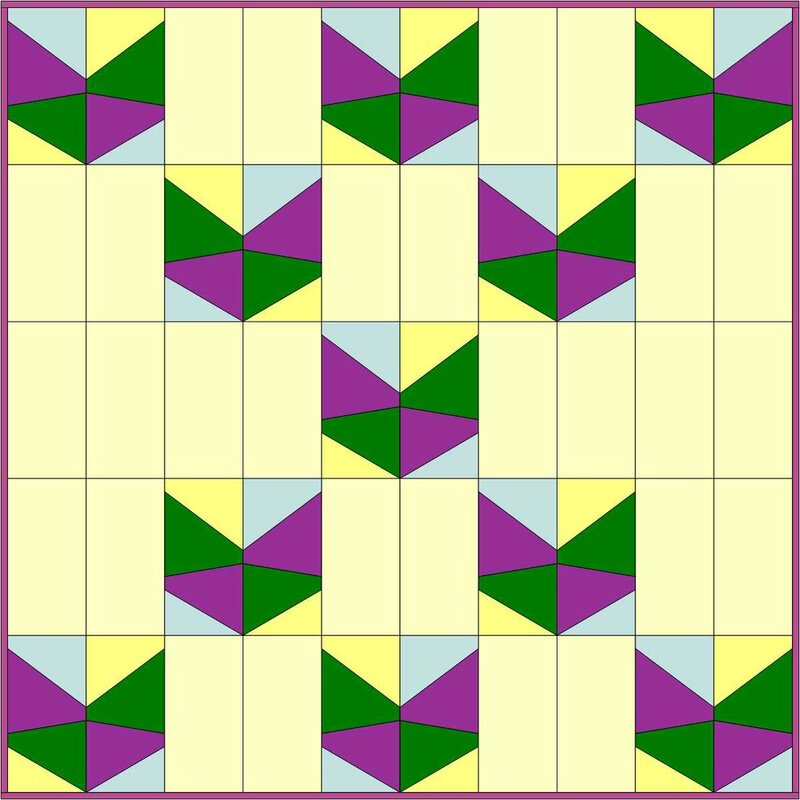 It was fun setting the flying geese blocks two different ways in this quilt. The quilt went together really quickly. When I finished it, it just seemed a bit long for it’s width. So I trimmed off about 2 1/2 inches from the two narrow ends of the quilt. The only fabric I needed to purchase was the backing, which I also used as the binding. I really like this design and would happily use it to make other quilts. 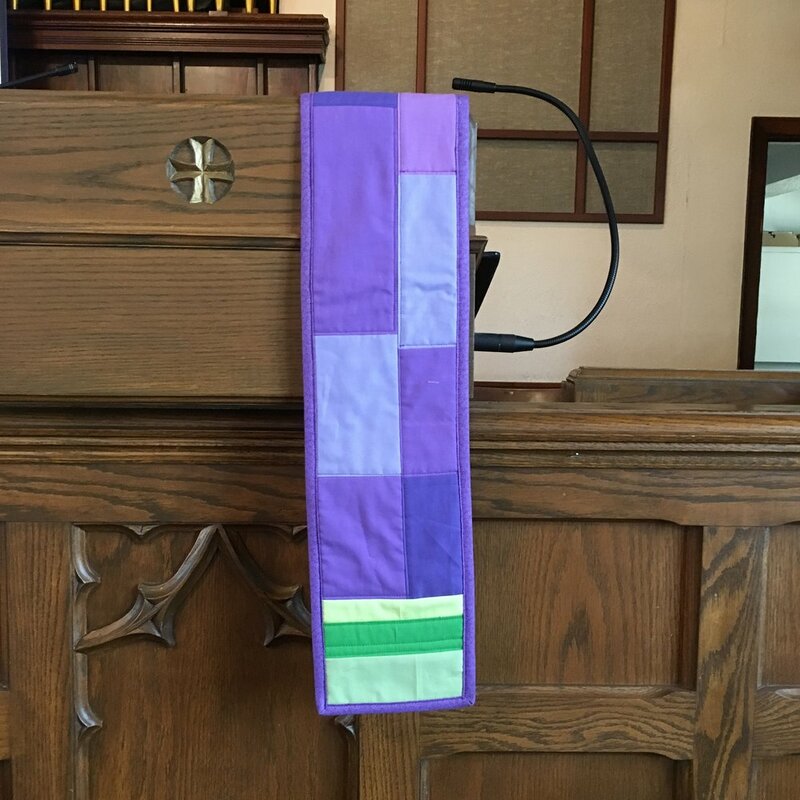 One of the pastors at my church liked the Advent pulpit banners that I designed and asked if I would make a pair for Lent. Both Advent and Lent are penitential seasons in the church calendar and the color is for both seasons is purple. I asked if I could modify the totally purple theme and the pastor said that was fine with her. (I did give her an idea where I was going color wise so I didn’t exactly have carte blanche)! For the pulpit hanging, I cut strips that were 3 1/2 inch wide and 2 1/2 inches wide. I pieced them in a random though semi-curated pattern. It was random enough that I didn’t have a good feel for the pattern until I sat in my regular pew and saw the finished hanging in place! I really liked what I was seeing. I added 3 strips of green to the bottom of the hanging. Green in the church calendar is for everyday, ordinary times. It’s the color that is used during most of the church year. So why did I add it to the purple? Lent is a season of preparation for new growth/rebirth/resurrection. I had been thinking a lot about the green shoots that bulbs often put up on a warm day in the middle of winter. It’s not their season to bloom and they are guaranteed to get buried in deep snow multiple times before they get their chance to bloom. The landscape is dark and brown, but here and there are light green tips of bulb, reminders that even in the depth of winter, growth is occurring. I find Lent to be a hard season, and I know I’m not alone. The light green reminds me this deep purple season is really about hope and growth. Our other pastor spontaneously picked on my second reason. She looked at them last Sunday and commented, that she likes the green because “the everyday” is a part of every season. And one final reason is purely about color—green plays really well with purple! On the lectern is a single thin hanging, 5 3/4 x 29 inches. I cut 3 inch strips and 2 1/2 inch strips for the lectern hanging. Lent lectern hanging, 5 3/4 x 29 inches. Both hangings have narrow 1 1/2 inch sleeve on the back side. A thin metal rod slips through the channel to hang them. And on the subject of the back, look what’s on the back of both pulpit hangings! Here’s the back of the lectern hanging before I put the sleeve on it. Surcoats slip over the head and can be worn over armor—they don’t have sleeves. I made these two sided so they woudn’t fray. It’s not quite the look I wanted, Using light weight voile fabric would have been a better choice. I ended up taking these surcoats off and painting on their armor. I like the Jerusalem cross but a bit of imagination is needed to see the other knight’s rampant lion! On a quest. The dragon is peaking out from behind the mountains. The two knights have part of their coat of arms painted on their armor. I cut the center of the dragon’s tail and embedded the orange raised ridge, And I skipped the snout in that is sewn to the head piece of the dragon in the book. He’s a very shy dragon. Not causing anyone any trouble! I like him a lot! While exploring places to buy the unfinished peg dolls, I discovered the wonderful world of unfinished wooden structures, blocks, toys and puzzle figures. The mountains and the castle blocks came from the Etsy shop, ClickityClack that is located in Michigan. They sell the peg dolls and a huge assortment of other items that they design and cut with a jigsaw. I really like the painted mountains but can’t decide about the castle. I like the bare wood, but can also seen them painted to look like stone walls with roses climbing on them! For now, I’m enjoying them as is! My niece gave me this pair of hand knit mittens for Christmas a few years ago. I often wear them to walk the dogs. I use a two hand hold on dog leads. The right hand holds the lead with the handle loop over my right right thumb. The left hand holds the lead on the side that is attached to the dog. It allows me a very secure hold and allows me to steer the dog, to bring her closer to be or let her have more length. As a result, the lead slides along the palm of the left mitten a lot. With time, the yarn on the left palm was getting thin. And even worse, the mitten was getting drafty! For this repair I referenced Visible Mending by Jenny Wilding Cardon and Tom van Deijnen’s great mending blog, tomofholland . I used a basic woven darn. 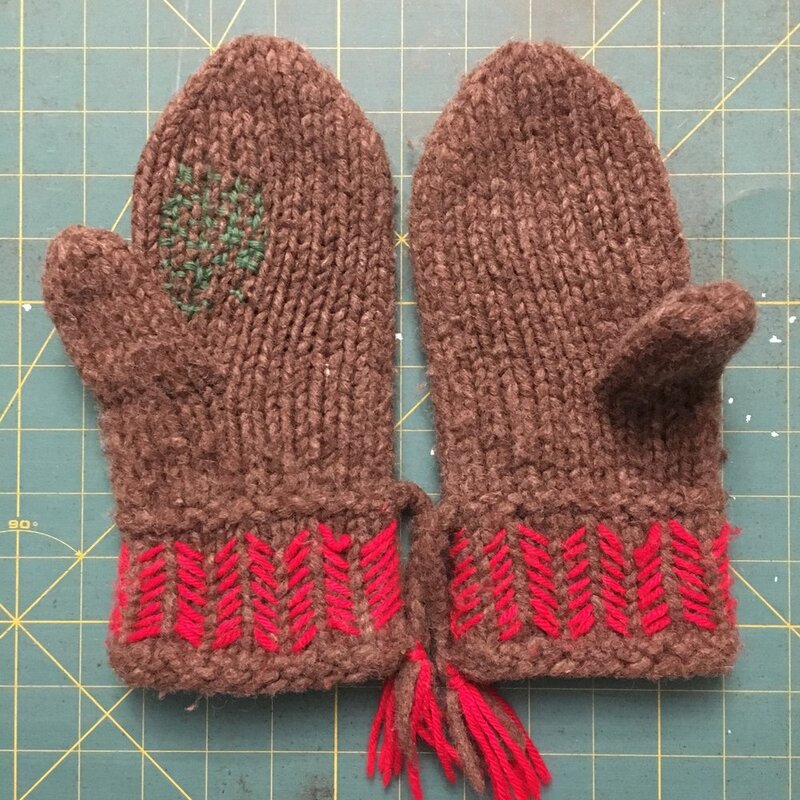 I used plain green worsted wool yarn which I knew would felt from the heat of my hands as I wear the mitten. 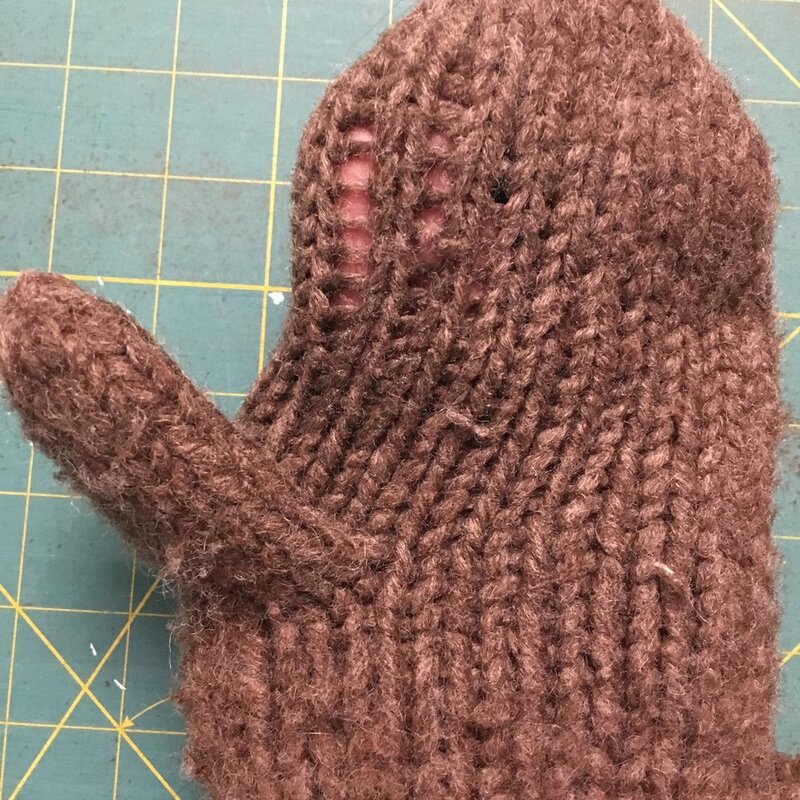 In fact, after just a few days, the repair is already starting to settle and felt into the brown wool of the mitten! I stitched an vertical in-and-out on the “ladders” between the rows. After doing that in all the threadbare areas, I wove in and out across horizontally across the rows. It was a bit tricky—the horizontal green yarn kept sliding under the larger brown yarn. As a result, my darning isn’t perfectly woven, but it has turned out to be just fine. This project wraps up my mending month of February! I had a lot of fun learning more about mending and am happy to have repaired a pair of pants, a mitten and a quilt! And that’s not all! At the Proper Bostonian Quilt Guild meeting the day before Valentine’s Day, we had a hands-on workshop on Japanese Boro mending which uses multiple layers of patches with sashiko stitching. We were told there was going to be a Valentine workshop but not what we where going to be doing. So I was delighted to find out it was another take on what I’d been doing all month! Here is my Boro Valentine. All supplies, including the hand-painted wood frame, were supplied by the woman running the workshop. Pretty sweet!! Close up of Visible Mending on a quilt. The cats seems to approve of the new addition! For years I had a delightful neighbor who was older and at home most of the time. She loved all animals and asked to look in on my puppies which was completely awesome back in the day when there weren’t many dog walkers. As she got older, my neighbors and I shoveled the snow off her sidewalk, picked up occasional groceries that she needed and regularly stopped to chat with her. Just before she moved to senior housing, one of her daughters made each of us a quilt to say thanks. Recently I noticed one of the seams in a block had failed. There wasn’t enough fabric to recreate a new 1/4 inch seam. Visible mending seemed like the perfect solution to repair the fractured block. Separated seam in a quilt block, top center of the block. I used Jessica Marquez’s Make and Mend as the resource for the sashiko design and information on sewing the patch. I picked the zigzag pattern and used grey sashiko thread for the stitching. (It took me a while to find some readily available sashiko thread but i finally found a wonderful collection of sashiko thread in multiple colors that were in stock and ready to ship at Purl Soho). First I did a slip stitch to bring together the two fabrics in the open seam. Then I measured a cut a patch from a solid red cotton for the patch. Then I drew a 1/2 inch grid on the block with a Fons & Porter chalk pencil and pinned it to the quilt block. Then I stitched the sashiko pattern per the instructions in the book. It only took me two hours to do all the stitching. I was surprised how quickly it stitched up! Here is the quilt with the repaired patch. I’m really happy with the repair. 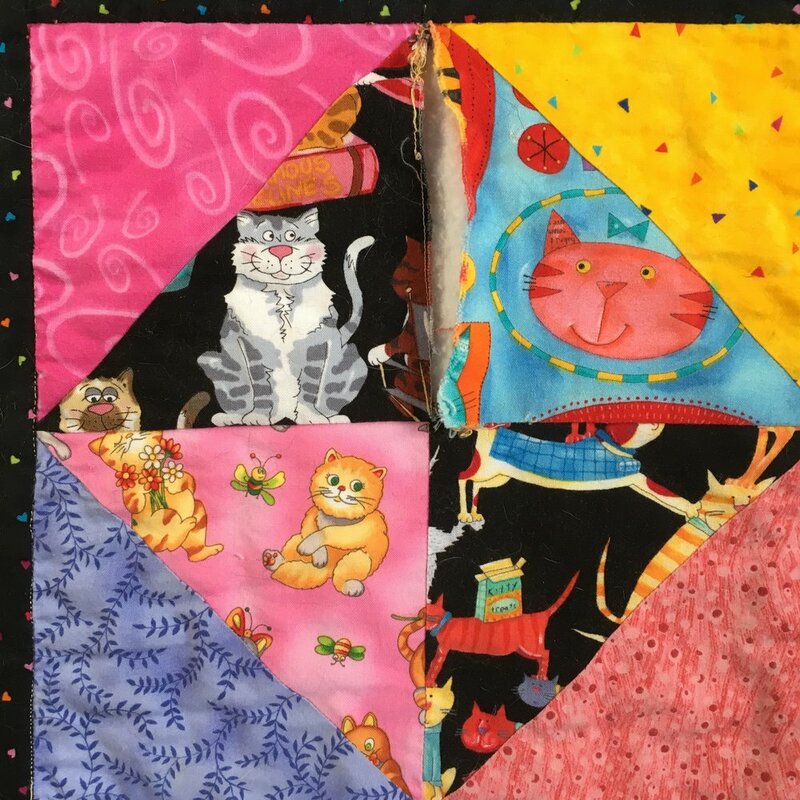 Rather than being a detraction, it adds interest to this special quilt. The sashiko mend plays happily with the blocks in this quilt. (Its in the far left rowd, 3rd block down). Next time I’ll share a repair on a knit—-a mitten I use for dog walks. Book Review: "Visible Mending, Artful Stitchery to Repair and Refresh Your Favorite Things"
More on mending! 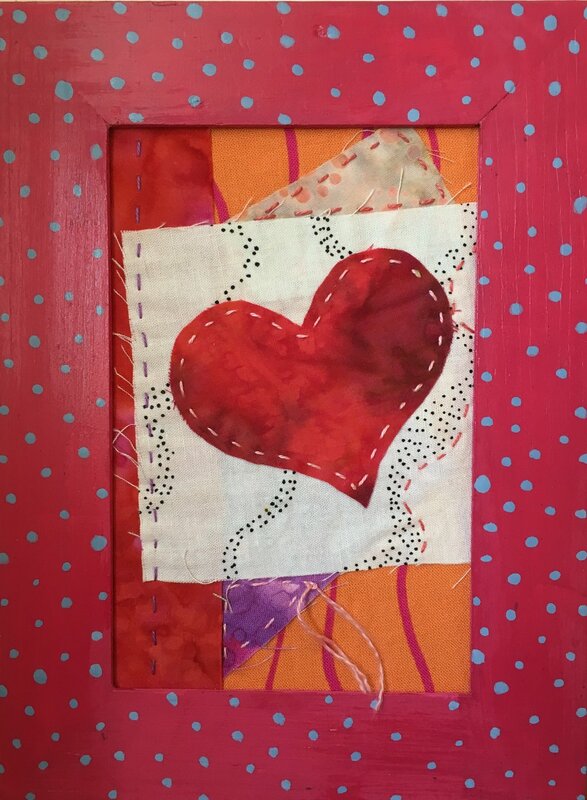 Visible Mending, Artful Stitchery to Repair and Refresh Your Favorite Things , by Jenny Wilding Cardon, is a great resource for anyone who wants to mend their own clothes, thrift store finds, and stained or torn children’s clothes. This is a fun book which covers 5 different types of mending—Japanese Boro menidng which uses sashiko type stitching, hand embroidery, patches, darning and using a sewing machine to mend. Each of the techniques has a list of supplies that will be needed and clear, tutorial-type photo illustrations of each step in the repair. I love the author’s story about a repair on her son’s T-shirt (see above, the bright teal grid of squares in upper right corner). He loved it so much he wanted to wear it to school the next day. He couldn’t because it was needed as an illustration for this book, but she sent him off to look in his drawers to find another shirt in need of repair! If that’s not a vote of confidence, I don’t know what is! Jenny has some really fun repairs: inset circles, holes left in place but turned into features with embroidery stitches that accent while stabilizing the hole, and woven darned repairs. She doesn’t just have repairs for clothes. There is one on a the rubber of a pair of beloved sneakers and other on an American flag (with information about what repairs can and can not be done on a flag). And finally, for folks who don’t want to do hand repairs, there a collection of machine mends with instruction s on how to do them. This is a very useful book and I’m happy to own it because many of the techniques resonate with techniques used in quilting. It is also a book that will be great for a busy parent or a thrifter who is recycling and accenting old clothes. Continuing the mending theme, I want to share two books I recently acquired. There are other books on mending but I’ve only purchased two. Today I’ll review a book about sashiko stitching and next week on mending book with a wider focus. Jessica Marquez’s book, Make and Mend, covers the art of Japanese sashiko stitching. Sashiko is a straight running stitch that is usually sewn in geometric patterns. The first part of the book discusses the technique, tools and thread and then has a variety of new projects that can be made. The projects run from a simple sachet to a really great market tote bag (see the back cover below for a glimpse of the tote). The second part of the book is about mending. Techniques include patching jeans, darning using a pattern of stitches, applique and three ways to change a hem. Finally, at the end of the book, there is a great collection of 20 sashiko pattern samplers with instructions on how to stitch the patterns. This is a beautiful book. It’s the sort of book that makes book lovers sigh with contentment. Just holding it makes me happy! If you want to learn sashiko stitching, or if you are a perfectionist and want your mending to be truly beautiful as well as functional, this this the book you should get! As much as I love this book, I’m not a perfectionist. Next week I’ll review a book that is closer to my style—have fun, do it well, and get it done! Mending. It was something my mother did and a skill she taught me. But as the 1900s came to an end, clothing became “disposable” and folks stopped mending and started throwing worn or torn clothing away. The pendulum as swung back with the Millennials who love to thrift! Japanese mending methods are being used to restore and accent old clothes. There are at least 3 books on mending that have been recently published. Imagine that! I’m intrigued. I’ve ordered two of them (the third, just published in the fall of 2018 is out of print but still available as an e-book). But I wanted to try a patch before I read what others are doing. So here’s a short tutorial for the patch I made for this pair of much loved ( and no longer available) flannel-lined Chino pants. Photos of the steps are shown below the instructions. Measure the hole you want to mend. Add at least 1/2 inch on all sides to allow for a 1/4 inch seam and a bit of extra fabric to be sure the hole is really covered. Cut out the patch, then turn under the edges 1/4 inch on all four sides and iron. Thread the needle and knot the end of the thread. Run the needle through the fabric from the wrong side to start sewing. Stitch around the four sides of the patch using a simple in-and-out running stitch. Your patch is now attached. You could stop here. Or you may keep sewing to make a patch that is stronger and more decorative. I chose to keep sewing, and decided to sew in parallel lines. I can make straight even stitches (I'm a quilter!) but I had problems with the double thick seams in the pant leg. The stitching was OK, but I didn’t love it. So I added the light blue embroidered flower which improved it. I’m very happy with my newly mended pants! The patch is fun and utilitarian,. I know it’s not a work of beauty which is totally fine for a pair of knock-around-in old pants. I’m looking forward to seeing the two books I ordered this week. I know from online previews that they do show how to do some truly beautiful mending. I can’t wait! Attempt at a group photo. The red squirrels were distracted by dog! The Snow Queen is standing at the back. The Twelfth Day of Christmas has come and gone, yet gnome fever still persists here! I found a lovely book, The Gnome’s Winter Journey, written by Ernst Kreidolf in 1924. It was just published in English in 2017. It has simple story about a family of Forest Gnomes going to visit their cousin, the Mountain Gnomes. They were looking forward to a big feast with their beloved Winter Queen and having competitive winter games in the snow. I decided to make peg dolls of the characters in the book so that a child can act out the story line in the book. Forest gnomes on the left, Mountain gnomes on the right. Below is a photo of the book cover with some of the dolls in the process of being made. It was so much fun making dolls that they look like the characters in a book. I did change up the mountain gnomes’ outfits….I didn’t have the right brown wool felt for their coats so I used orange instead. (They rather liked them)! The last photo is of the Snow Fairies. They are really shy! And the Ice Gnome who is grumpy because one the Forest Gnomes were climbing up the icicles and broke one! I like my peg dolls to have natural wood faces. But there is a tendency for the paint to run with the wood grain of the peg when adding fine details like eyes to the raw wood surface. Nobody wants a runny eye! Acrylic paint seals the wood so fine details can be added without the paint running. I hunted around a found a clear acrylic gesso that is certified to be free of known health hazards. I paint a very thin layer just on the face of the doll. Then when dry, add the facial features. 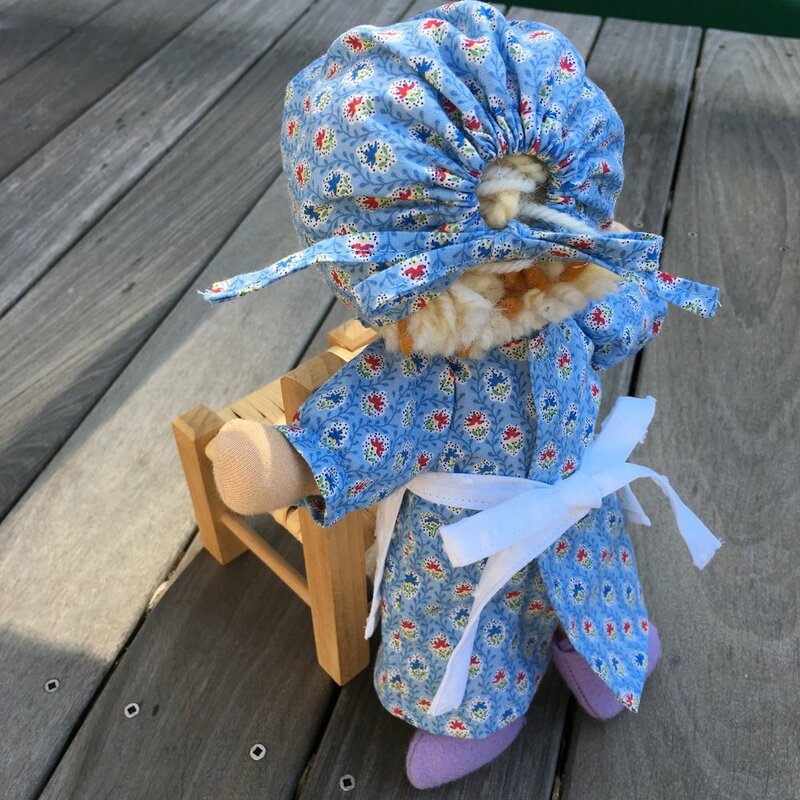 For more information on making peg dolls, see my post, Peg Dolls, from December 27, 2018. Ribbon Suspenders. 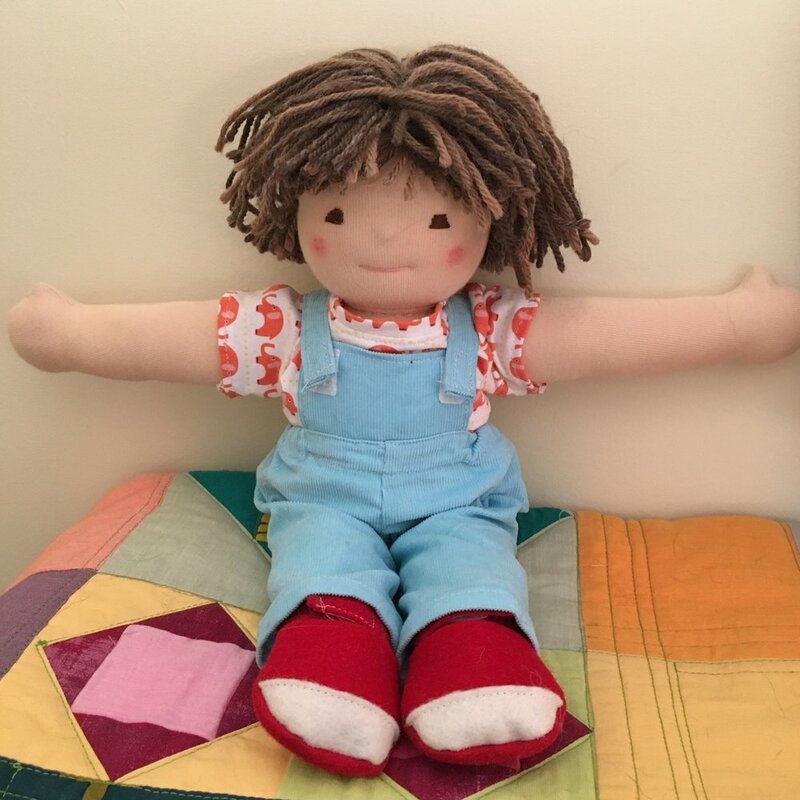 The doll, jeans and T shirt were made by Bamboletta Ltd.
There’s just something about the Bamboletta Cuddle Dolls. They are so sweet and they sit so nicely. But they have the hardest time keeping their pants up! After thinking about this, I decided suspenders are a great solution. I set about designing a set of suspenders that only required a little bit of sewing. Photos of the steps are below, under all the instructions. Due to the use of ribbons, these suspenders should only be used on dolls played with by children age 3 years and older. Please have an adult sew the hook and loop fasteners to the pants. 1/2 yard of 3/4 inch wide grosgrain ribbon. Twill tape would be great too. 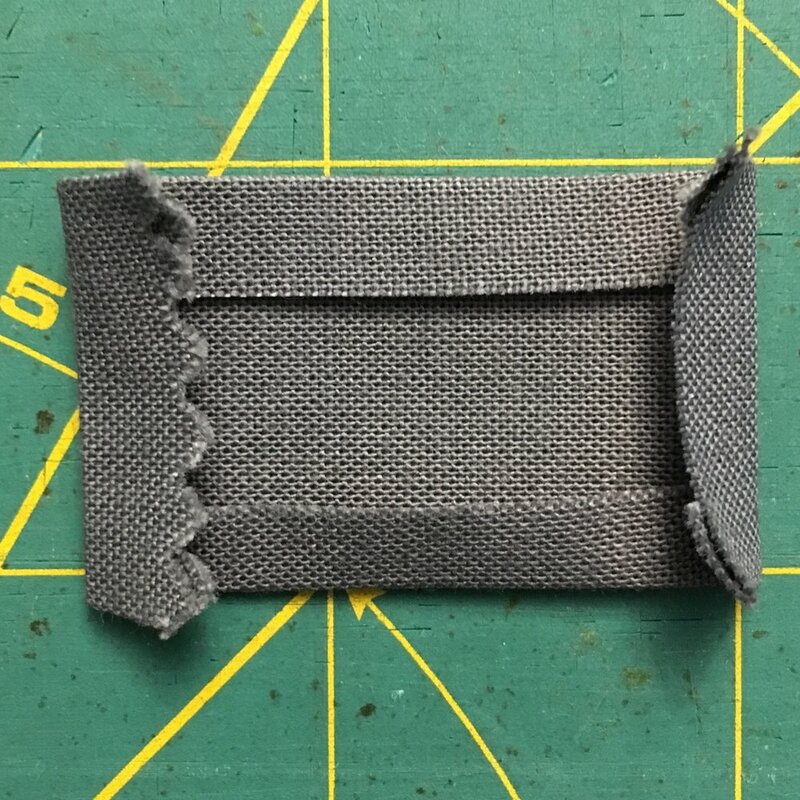 3/4 inch wide regular sew-on hook and loop fastener (Velcro®). Two inches is plenty. Sewing machine. (This project could be done by hand but it’s hard hand sew through hook and loop fastener tape). Put the pants on the doll. Smooth out the gathering at the front of the pants, pushing the gathers towards the sides of the doll. Place a pin about 1 1/4 inch away from the center seam of the jeans on left and right sides. This marks the place you will sew the fastener to the pants. Cut two 9 inch pieces of ribbon. Fold the edge under on one side and press it down with your finger. Cut two pieces of hook and loop fastener just slightly narrower than your ribbon. This works best if you turn the tape on its side, rather than cutting it in the direction it comes off the roll. Sew the loop portion of the fastener (that’s the soft fuzzy tape) to the ribbon, making sure that the raw end you folded is under the fastener. Sew the hook portion of the fastener (the hard loopy side) to the front of the pants where you placed your pins. Now attach both ribbons to the pants using the fasteners you just sewed on. Put the pants on the doll and turn the doll over, facing away from you. Bring the ribbons over to the back. Cross the two ribbons and tuck them into the back of the pants. Pin the ribbons to the pants on each side. Also put a pin in ribbons where they cross over each other. Sew the ribbon to the back of the pants along the line of stitches on the pants that made the channel for the elastic inside them. You are all done!! Put the pants on your doll and fasten the beautiful suspenders you just made! Great job! No more droopy pants for your dolls! If your Bamboletta Sitting Friends need suspenders too, cut the ribbons 9 1/2- 10 inches long. The sewing instructions are the same! I know lots of blogs are currently setting up schedules, and mapping out posts for 2019. Not me! I’m just not sure what this blog should look like in the coming year. I started blogging almost five years ago. I’d just taken early retirement and was contemplating starting a new career in quilting. It took me a couple years to figure out that really wasn’t the path I wanted to take. I do love making, especially fiber related projects, not just quilts! But after 5 years, I’m beginning to run out of new projects to share. I don’t want to make things just to “feed the blog.” And it doesn’t make sense for this blog to just be my personal Show and Tell platform. So, what to do? I’m still trying to figure that out. I plan to continue the blog, for now. But expect my posts to be more sporadic. Posts will still release on Thursdays, just not every week. I’ll post when I have something to share that I think is interesting or might be something some of you will want to make or learn about. Let’s see how this goes! Hopefully this will be a change for the better! See my last post, Peg Dolls, for information about making peg dolls like the 3 peg gnomes in the photo above! To end out 2018, here’s another type of doll that I’ve been making recently. 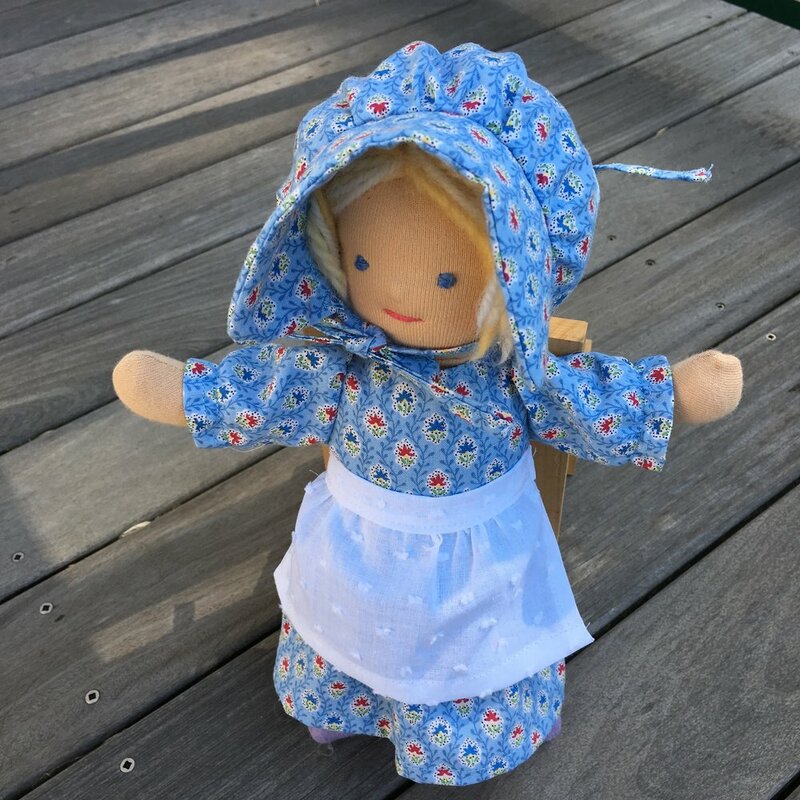 Peg dolls are made of wood, usually birch or maple and come ready to paint and dress. I rediscovered them when I was searching Etsy.com for gnomes before Christmas. 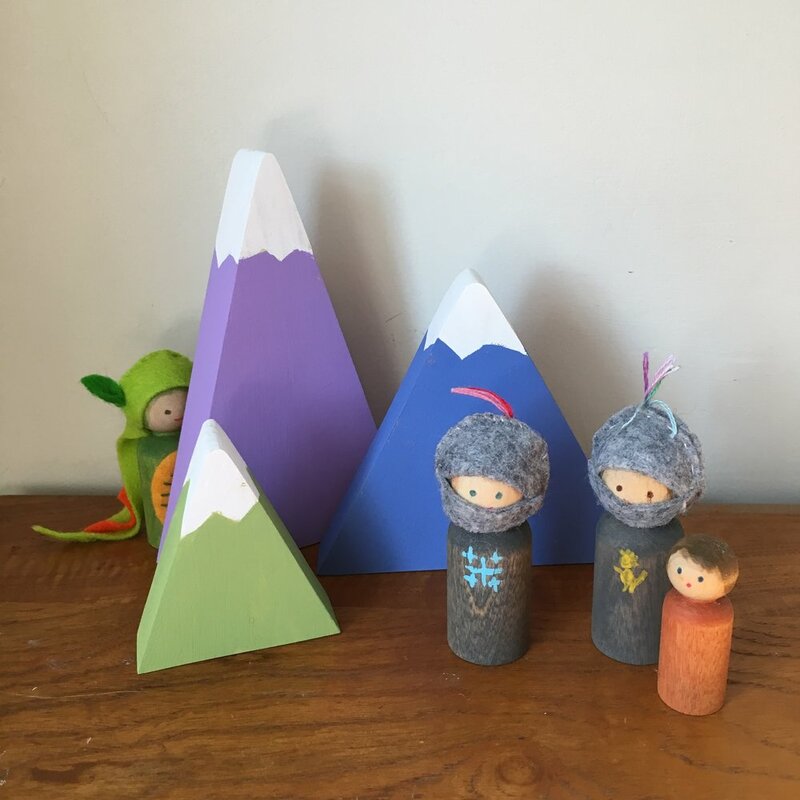 There are so many fun ways to use the wooden peg dolls. Margaret Bloom has written a great book, Making Peg Dolls, which has lots of wonderful ideas for making dolls and patterns for hats, cloaks and crowns which can be traced. I got the dolls, opaque watercolors, wool felt, pipecleaners, and beeswax polish from the online store, A Child’s Dream. Here are a few of the peg dolls I’ve made this month. They are all based on dolls in the book recommended above, but I’ve done things differently on some of the dolls. 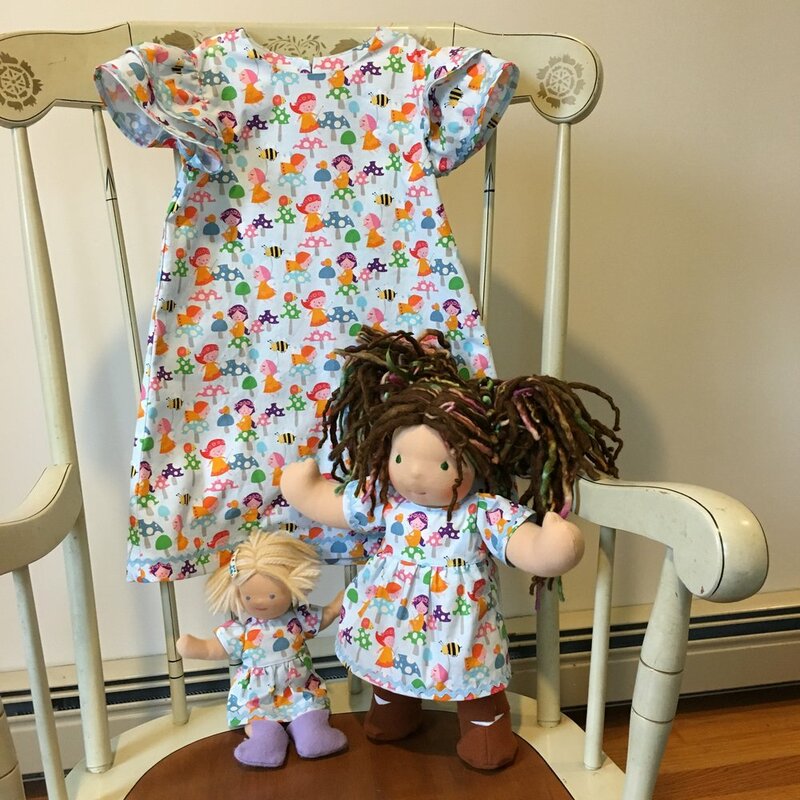 The dolls come in all sizes—from big at 3 9/16 inches to tiny at 1 1/4 inches tall. 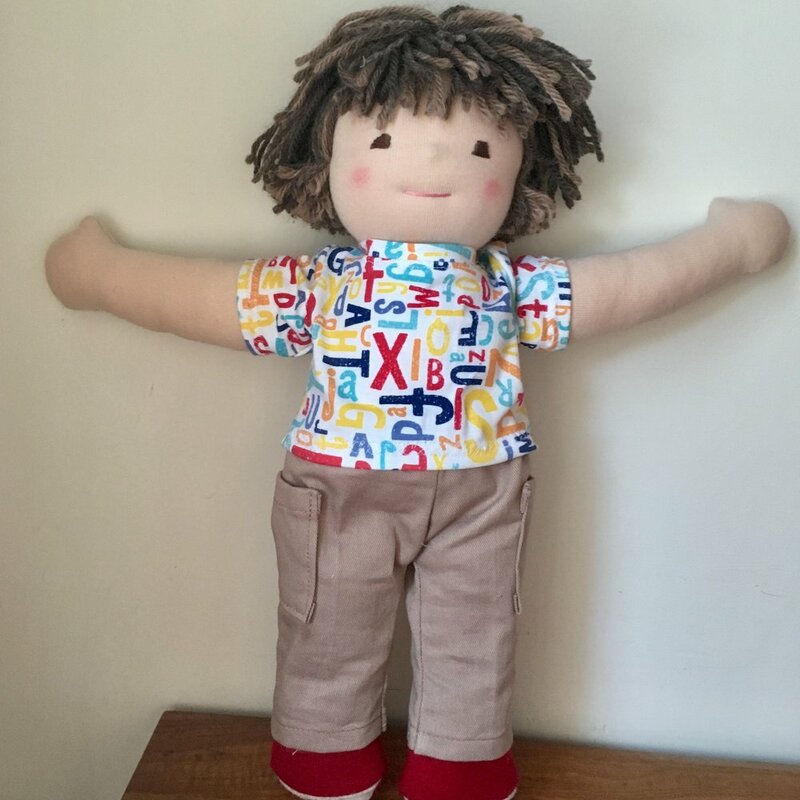 The largest 3 9/16 inch peg dolls are fine for a toddler. The smaller dolls are a choking hazard (as are some of the outfits) and are NOT for children under age 3 years old. 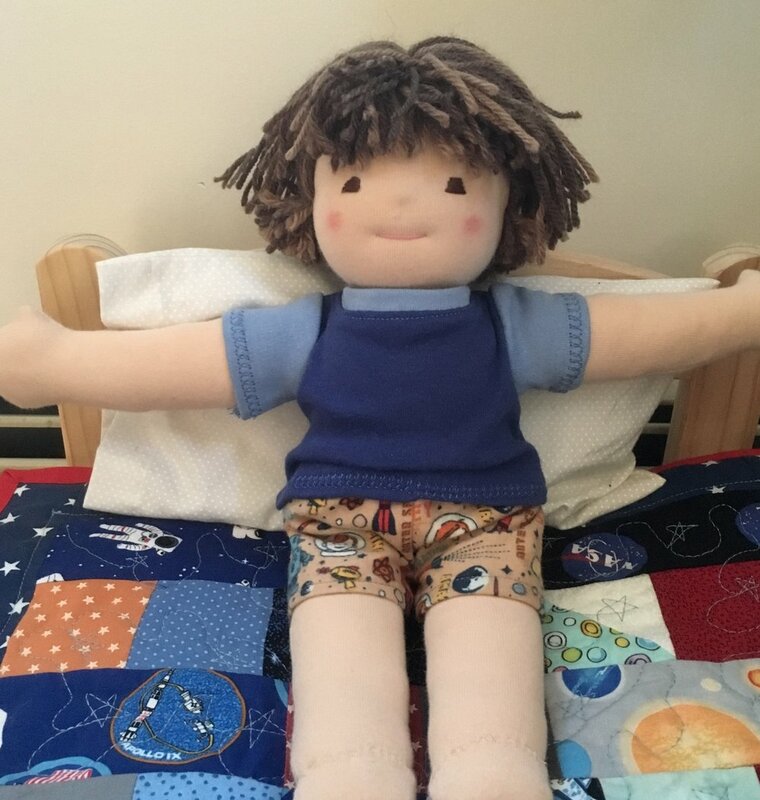 None of the dolls shown in these pictures are toddler safe but they are lots of fun for older children, and adults love them too. I have a box of assorted size pegs. I can’t wait to see who they become! When I recently made two Charity Christmas quilts and a dog Christmas quilt, I had some left over strips and several orphan blocks. I decided they would make great doll Christmas quilts. Two of the quilts are for typical doll beds, the two smaller ones are for a doll bunk bed. They were fun to make and fun to quilt. (I quilted all of them waiting for the plumber to come one day to do a winter tune up on my furnace. Seemed appropriate)! Here they are hanging on the line together! The backs are fun too. 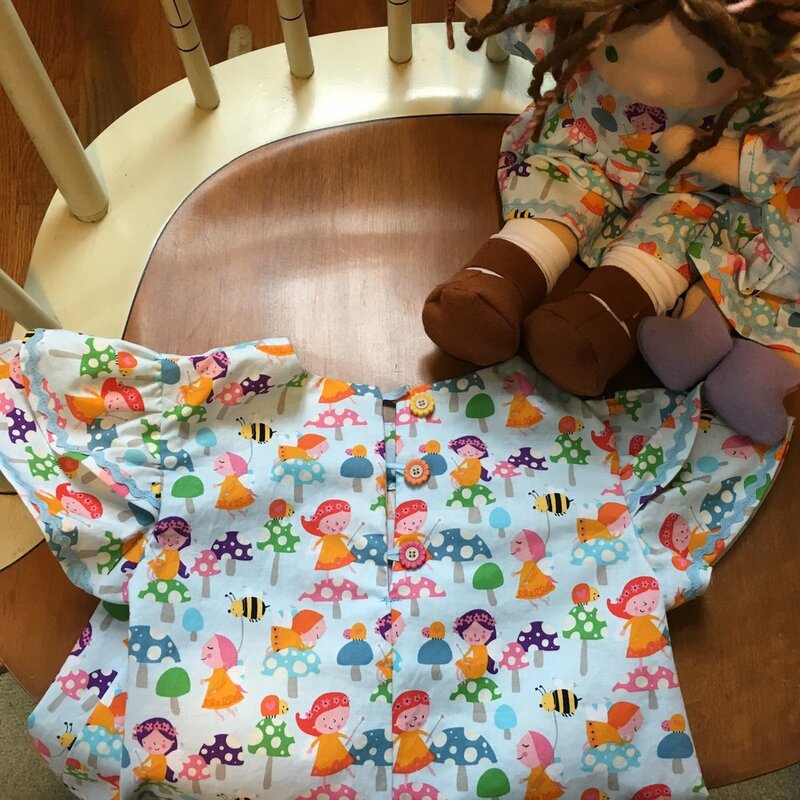 I especially like the forest fairy fabric—a scrap a friend gave me! 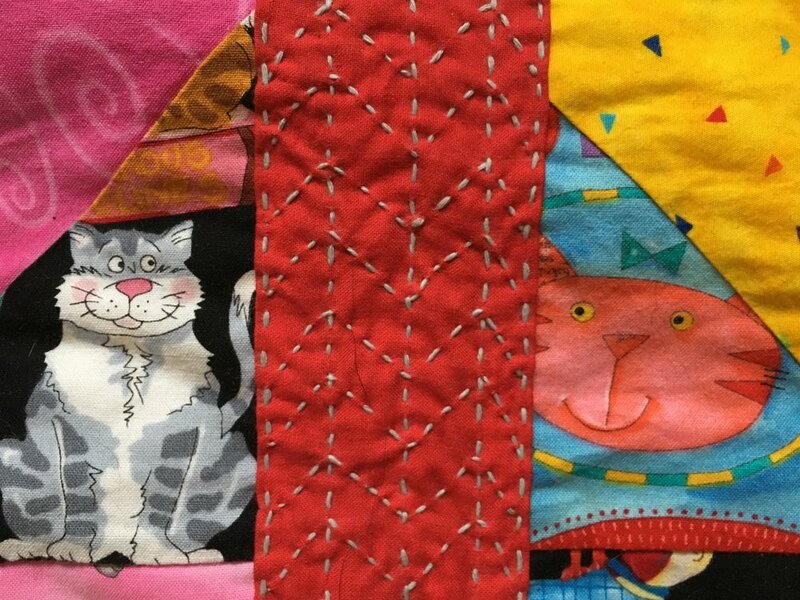 These quilts are a totally satisfactory use of fabric straps and orphan blocks! I like this block so much I’ve decided to make a Poppy Quilt. As of right now, I’ve made 12 poppy blocks. They are 8 1/2 inch now and will finish at 8 inches square. I’m still contemplating the overall pattern for the quilt. My old design wall, a vinyl St Patrick’s Day tablecloth with a fuzzy back, had been used so many times, that it was getting brittle, shredding along the edges, and covered with thread and really no longer useable. But I recently picked up a Christmas tablecloth so now I can start working on the quilt design. I think it will be fairly modern, with lots of negative space. But time will tell! I’ll keep you posted as to my progress!